India's Output Management Software (OMS) market is still in the nascent stage. Over the past few years enterprises have started to realize the potential of OMS solutions owing to increasing volume of data and customer interactions. Several digital initiatives taken by the Government of India, increased IT spending coupled with increasing adoption of Social, Mobility, Analytics and Cloud (SMAC) solutions have led for the growth of OMS market in India. 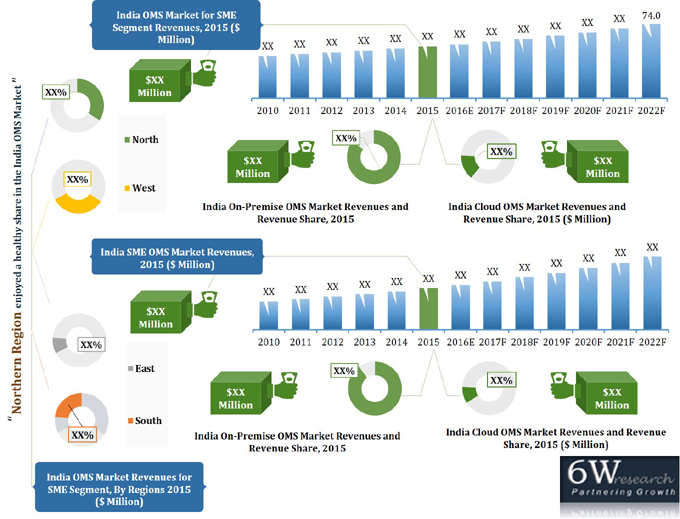 According to 6Wresearch, India Output Management Software market revenue is projected to reach over $74 million by 2022. Presently, On-Premise output management solutions accounted for majority of the market demand, whereas the cloud OMS segment have seen very few installations in past few years. In SME segment, output management solutions are relatively growing at higher CAGR owing to increasing adoption of SMAC. Further, in SME segment, On-Premise solutions accounted for major share of the market and is likely to maintain its dominance over the next six years. However, cloud output management solutions are likely to grow at a higher CAGR as compared to On-Premise output management solutions. Amongst the regions, Northern India accounted for largest share in output management software market in India followed by Western India, Southern India and Eastern India. The report thoroughly covers output management software market types, small and medium business verticals and regions. The report provides an unbiased and detailed analysis of the on-going trends, opportunities/high growth areas, market drivers which would help the stakeholders to decide and align their market strategies according to the current and future market dynamics. 11.2	Newgen Software Technologies Ltd.